‘In a figure like Khandro Tsering Chödrön, the greatest woman master of our day, you see very clearly what years of the deepest devotion and practice can create out of the human spirit.’ Sogyal Rinpoche in the Tibetan Book of Living and Dying. Khandro Tsering Chödrön was revered as one of the greatest woman masters of recent times and her presence at Lerab Ling during her final years of her life was a tremendous source of blessing for all. In loving memory of this truly exceptional spiritual practitioner, Sogyal Rinpoche initiated the construction of a stupa at Lerab Ling to contain her relics. Supervised by the expert master, Tulku Rigdzin Pema, the stupa will be completed by July 2014, ready for consecration by His Holiness Sakya Trizin and other great masters we have invited. To mark this very special occasion, His Holiness Sakya Trizin, Sogyal Rinpoche, and other guest masters, will give a series of teachings and empowerments over the course of this 9-day retreat that is open to all Dharma practitioners. 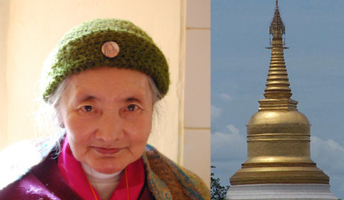 We warmly invite everyone who has a special connection with Khandro Tsering Chödrön, or the guest masters who will be present, to attend this exceptional event from 26 July – 3 August. We will have more information closer to the event, but for now you can register and book your travels in advance.